The American Revolutionary War (1775-1783), also known as the American War of Independence, was a war between the Kingdom of Great Britain and thirteen British colonies on the North American continent (as well as some naval conflict). The war was the culmination of the political American Revolution, whereby the colonists overthrew British rule. In 1775, Revolutionaries seized control of each of the thirteen colonial governments, set up the Second Continental Congress, and formed a Continental Army. The following year, they formally declared their independence as a new nation, the United States of America. From 1778 onward, other European powers would fight on the American side in the war. Meanwhile, Native Americans and African Americans served on both sides. Throughout the war, the British were able to use their naval superiority to capture and occupy coastal cities, but control of the countryside (where 90% of the population lived) largely eluded them due to their relatively small land army. In early 1778, shortly after an American victory at Saratoga, France entered the war against Britain; Spain and the Netherlands joined as allies of France over the next two years. French involvement proved decisive, with a French naval victory in the Chesapeake leading to the surrender of a British army at Yorktown in 1781. The Treaty of Paris in 1783 ended the war and recognized the sovereignty of the United States over the territory bounded by what is now Canada to the north, Florida to the south, and the Mississippi River to the west. The war of American independence could be summed up as a civil war fought on foreign soil, as opposing forces comprised both nations' residents. That said, it is a war that America could not have survived without French assistance. In addition, Britain had significant military disadvantages. Distance was a major problem: most troops and supplies had to be shipped across the Atlantic Ocean. The British usually had logistical problems whenever they operated away from port cities, while the Americans had local sources of manpower and food and were more familiar with (and acclimated to) the territory. Additionally, ocean travel meant that British communications were always about two months out of date: by the time British generals in America received their orders from London, the military situation had usually changed. 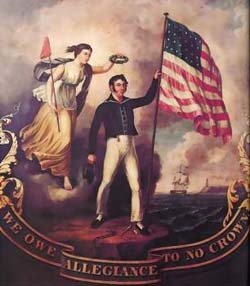 The British also had the difficult task of fighting the war while simultaneously retaining the allegiance of Loyalists. Loyalist support was important, since the goal of the war was to keep the colonies in the British Empire, but this imposed numerous military limitations. Early in the war, the Howe brothers served as peace commissioners while simultaneously conducting the war effort, a dual role which may have limited their effectiveness. Additionally, the British could have recruited more slaves and Native Americans to fight the war, but this would have alienated many Loyalists, even more so than the controversial hiring of German mercenaries. The need to retain Loyalist allegiance also meant that the British were unable to use the harsh methods of suppressing rebellion they employed in Ireland and Scotland. Even with these limitations, many potentially neutral colonists were nonetheless driven into the ranks of the Revolutionaries because of the war. This combination of factors led ultimately to the downfall of British rule in America and the rise of the revolutionaries' own independent nation, the United States of America. Explore millions of American Revolutionary War documents that are found nowhere else on the Internet. , Discover details about individual soldiers, read letters penned by the Founding Fathers, view documents from The Continental Congress and more. Search Historical Newspapers from 1680 to the Revolutionary War period - Quickly find names and keywords in over 2,800 historical U.S. newspapers. United States History - covers the development of the United States from the history of early exploration through modern times. American historical people are presented in the context of the development of the American nation on political, economic, and social planes.